The Behringer Neutron: a paraphonic analog and semi-modular synthesizer with dual 3340 VCOs, multi-mode VCF, 2 ADSRs, BBD delay and overdrive circuit in a Eurorack format. 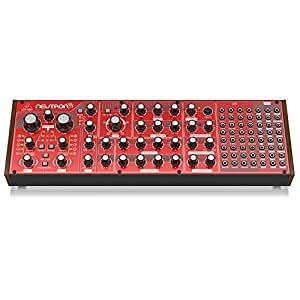 An updated incarnation of its predecessors with all the original features and then some, the BEHRINGER NEUTRON lets you conjure up virtually any monophonic sound imaginable with incredible finesse and ease. The pure analog signal path is based on authentic VCO, VCF, VCA and state variable filter designs in conjunction, with a flexible, multi-wave LFO and classic Bucket Brigade Delay (BBD). NEUTRONâs Paraphonic mode allows both 3340 analog oscillators to be independently controlled for an expanded palette of tonal options. And when it comes to protection and convenience, the NEUTRON can be mounted in a standard Eurorack, making it ideal for the studio and/or the road. Owning a NEUTRON is like having your own personal time machine, enabling you to freely embrace the past â or shape the future! Designed around an intuitively-linear workflow, NEUTRON benefits greatly from its semi-modular design, which requires no patching for immediate performance. Just put your NEUTRON into self-oscillation, connect your favorite keyboard or computer via MIDI over DIN or USB â and start exploring the world of analog music synthesis right out-of-the-box.